Peterbilt has announced that its ergonomically designed column-mounted shifter will be standard equipment on Model 579 and 567 trucks equipped with the new Paccar Automated Transmission. 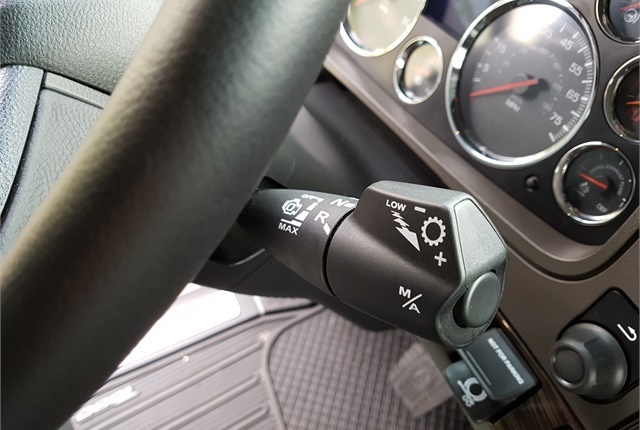 The column-mounted shifter will also be standard equipment on trucks equipped with the Eaton Advantage and Ultra Shift AMTs. The column-mounted shifter will be available on Model 579 and 567s ordered with automated transmissions beginning in Oct. 2017. The new shifter, located on the right-hand side of the steering column, features a multi-mode design that allows for control of all transmission and engine brake functions, including gear selection, engine brake mode, and manual shifting. The column-mounted shifter was designed to place controls in a more convenient location, to minimize distractions and allow for increased focus on the road. With the implementation of a column-mounted lever, a new design pinch valve located on the dash replaced the traditional lever for trailer brake activation, enhancing control during coupling and uncoupling maneuvers. The new 12-speed automated transmission from Paccar is the latest addition to the proprietary Paccar Powertrain, designed for efficiency, drivability, and durability for Peterbilt on-highway models. The transmission was purpose-developed as an automated transmission for heavy-duty linehaul applications. The Paccar Automated Transmission is available for order immediately on MX-13 equipped Model 579 and 567s scheduled for production after Oct. 16, 2017. Availability of the Paccar Transmission with the smaller Paccar MX-11 engine is scheduled for early 2018.